With Power Query, working with data dispersed across worksheets or even workbooks has become easier. 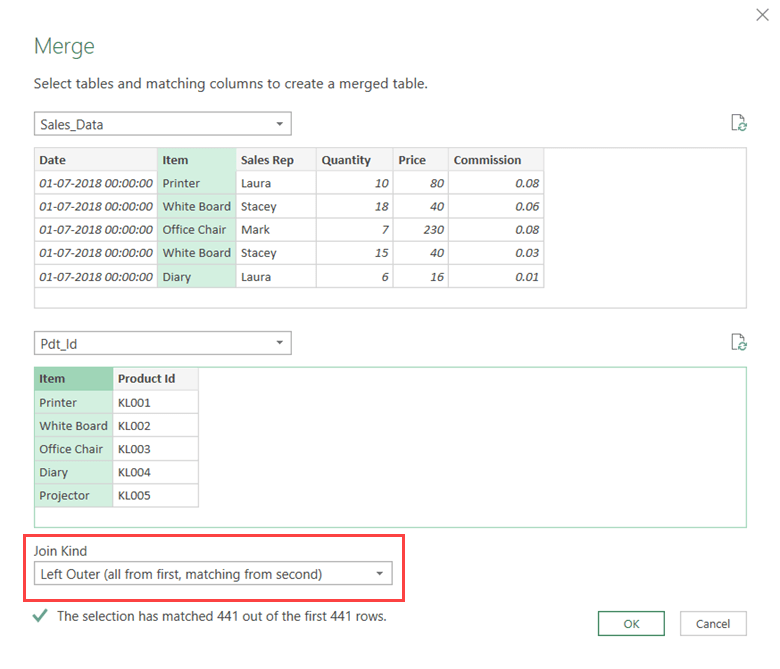 One of the things where Power Query can save you a lot of time is when you have to merge tables with different sizes and columns based on a matching column. 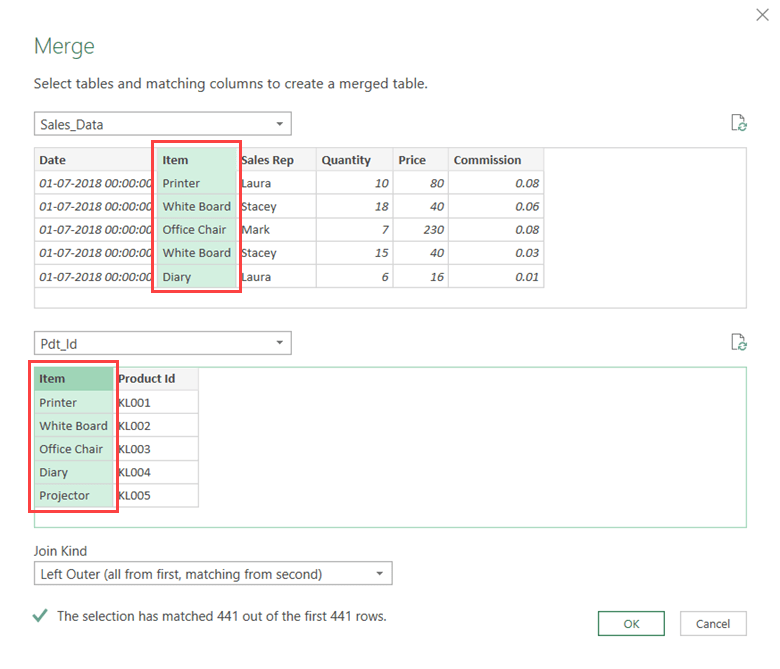 Below is a video where I show exactly how to merge tables in Excel using Power Query. In case you prefer reading the text over watching a video, below are the written instructions. This table has the data I want to use, but it’s still missing two important columns – the ‘Product Id’ and the ‘Region’ where the sales rep operates. 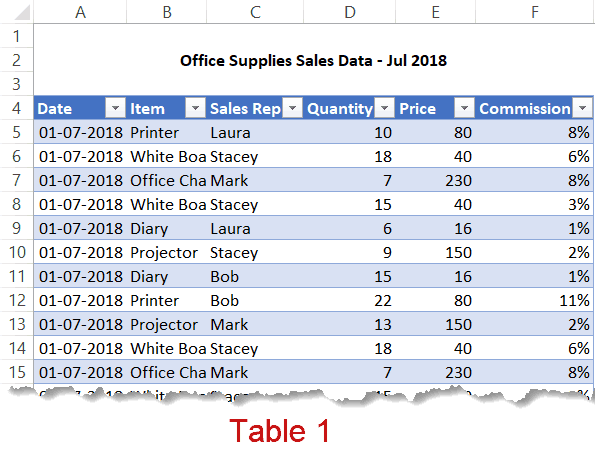 To get all this information into a single table, you will have to merge these three tables so that you can then create a Pivot Table and analyze it, or use it for other reporting/dashboarding purposes. And by merging, I don’t mean a simple copy paste. You’ll have to map the relevant records from Table 1 with data from Table 2 and 3. Now you can rely on VLOOKUP or INDEX/MATCH to do this. Or if you’re a VBA whiz, you can write a code to do this. But these options are time-consuming and complicated as compared with Power Query. In this tutorial, I will show you how to merge these three Excel tables into one. For this technique to work, you need to have connecting columns. For example, in Table 1 and Table 2, the common column is ‘Item’, and in Table 1 and Table 3, the common column is ‘Sales Rep’. Also, note that there should be no repetition in these connecting columns. Note: Power Query can be used as an add-in in Excel 2010 and 2013, and is an inbuilt feature from Excel 2016 onwards. Based on your version, some images may look different (image captures used in this tutorial are from Excel 2016). It isn’t mandatory to rename these tables, but it’s better to give names that describe what the table is about. 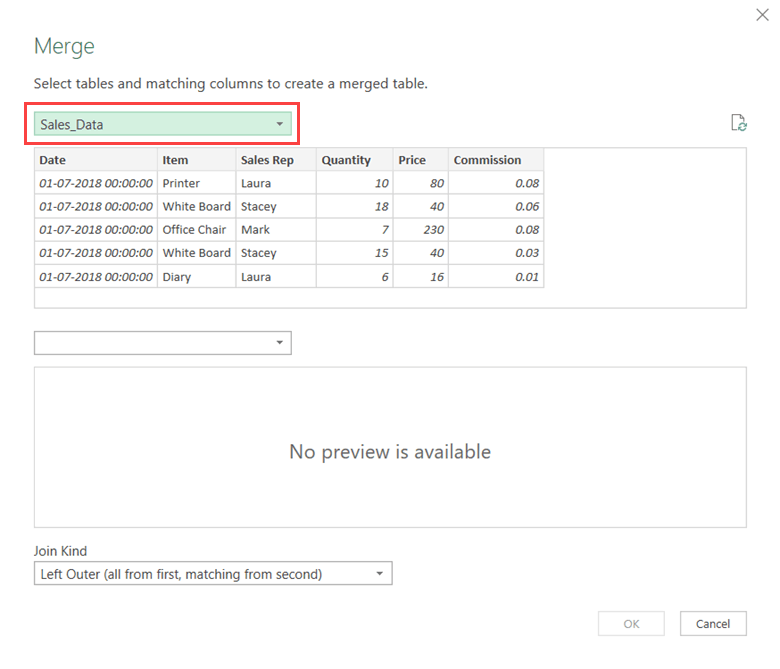 At one go, you can merge only two tables in Power Query. So we will first have to merge Table 1 and Table 2 and then merge Table 3 into it in the next step. 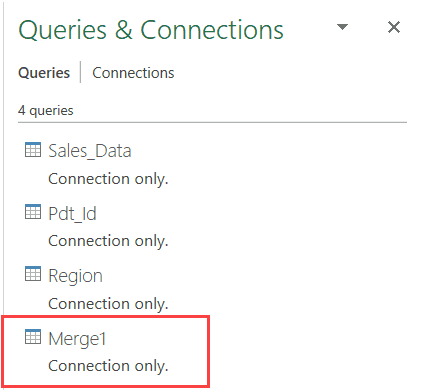 To merge tables, you first need to convert these tables into connections in Power Query. Once you have the connections, you can easily merge these. Select any cell in Sales_Data table. In the Get & Transform group, click on ‘From Table/Range’. This will open the Query editor. In the Query editor, click the ‘File’ tab. 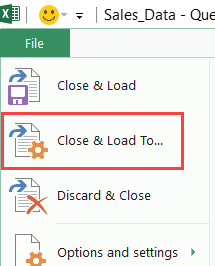 Click on ‘Close and Load To’ option. In the ‘Import Data’ dialog box, select ‘Only Create Connection’. 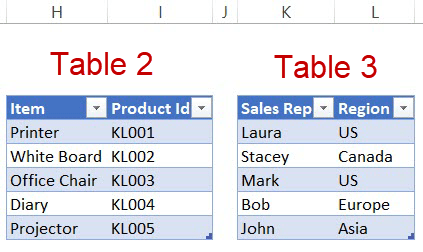 The above steps would create a connection with the name Sales_Data (or any name that you have given to the Excel Table). Repeat the above steps for Table 2 and Table 3. So when you’re done, you will have three connections (with the name Sales_Data, Pdt_Id, and Region). 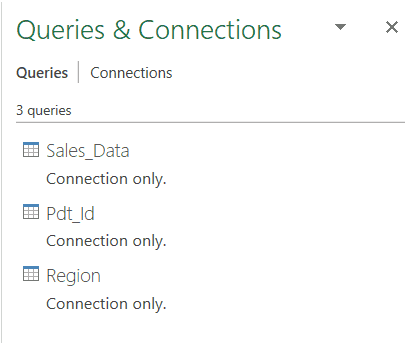 Now let’s see how to merge the Sales_Data and Pdt_Id table. In the Get & Transform Data group, click on Get Data. In the drop-down, click on Combine Queries. Click on Merge. This will open the Merge dialog box. In the Merge dialog box, select ‘Sales_Data’ from the first drop down. Select ‘Pdt_Id’ from the second drop down. In ‘Sales_Data’ preview, click on the ‘Item’ column. Doing this will select the entire column. In ‘Pdt_Id’ preview, click on the ‘Item’ column. Doing this will select the entire column. In the ‘Join Kind’ drop-down, select ‘Left Outer (all from first, matching from second)’. 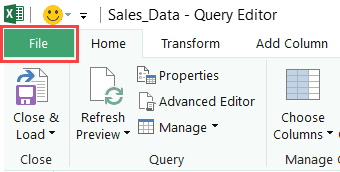 The above steps would open the Query editor and show you the data from the Sales_Data with one additional column (of Pdt_Id). In the additional column (Pdt_Id), click on the double pointed arrow in the header. From the options box that opens, uncheck all the column names and only select Item. This is because we already have the product name column in the existing table, and we only want the product ID for each product. Uncheck the option ‘Use original column name as prefix’. This would give you the resulting table that has every record from Sales_Data table and an additional column that has product ids as well (from the Pdt_Id table). Now if you only want to combine two tables, you can load this Excel you’re done. But we have three tables to merge, so there is more work to be done. You need to save this resulting table as a connection (so that we can use it to merge it with Table 3). This will save the newly merged data as a connection. You can rename this connection if you want. The process of merging the third table with the resultant table (that we got by merging Table 1 and Table 2) is exactly the same. In the Get & Transform Data group, click on ‘Get Data’. In the drop-down, click on ‘Combine Queries. Click on ‘Merge’. This will open the Merge dialog box. In the Merge dialog box, Select ‘Merge1’ from the first drop down. Select ‘Region’ from the second drop down. In ‘Merge1’ preview, click on the ‘Sales Rep’ column. Doing this will select the entire column. In Region preview, click on the ‘Sales Rep’ column. Doing this will select the entire column. In the ‘Join Kind’ drop-down, select Left Outer (all from first, matching from second). 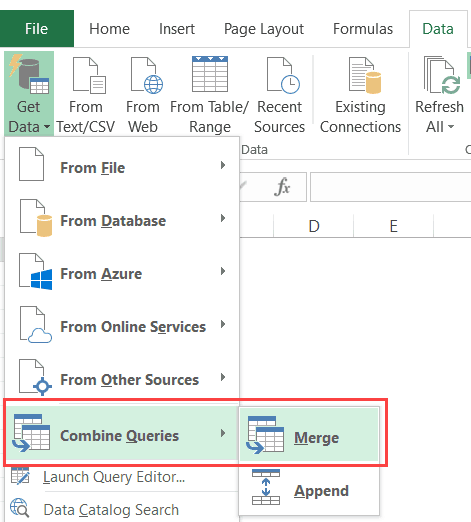 The above steps would open the Query editor and show you the data from Merge1 with one additional column (Region). In the additional column (Region), click on the double pointed arrow in the header. From the options box that opens, uncheck all the column names and only select Region. 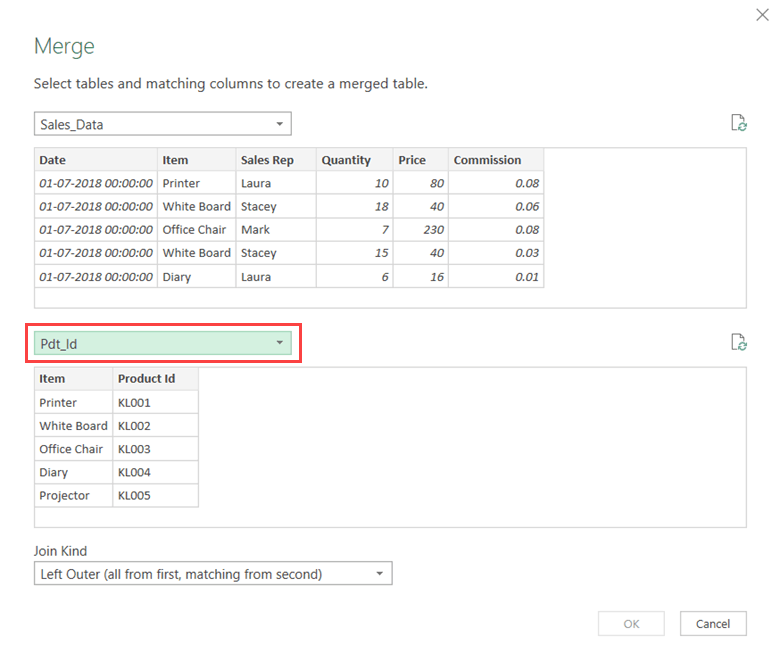 The above steps would give you a table that has all the three tables merged (Sales_Data table with one column for Pdt_Id and one for Region). Click on ‘Close and Load to’. In the ‘Import Data’ dialog box, select Table and New Worksheets options. This would give you the resulting merged table in a new worksheet. One of the best things about Power Query is that you can easily accommodate any changes in the underlying data (Table 1, 2 and 3) by simply refreshing it. For example, suppose Laura gets transferred to Asia and you get new data for the next month. Now you don’t have to repeat the above steps again. All you need to do is refresh the table and it will do everything it all over again for you. Within seconds you’ll have the new merged table. 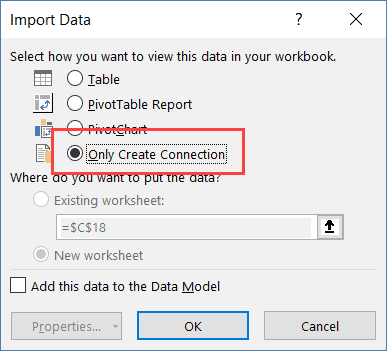 Combine Data from Multiple Workbooks in Excel (using Power Query). 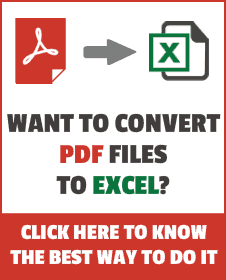 Combine Data From Multiple Worksheets into a Single Worksheet in Excel. Wonderful tutorial! Please can you give the link to the data you used for both write-ups and youtube?